Sagittarius, in 2017 you'll encounter many surprises. Unlike previous years, you can expect rougher way of life and the experiences bringing shock and wonder. However, do not be fooled. Obstacles are not here to make you upset and to obscure your vision of a sunny future. On the contrary! Your element is fire, so embark on overcoming difficulties with vigor. 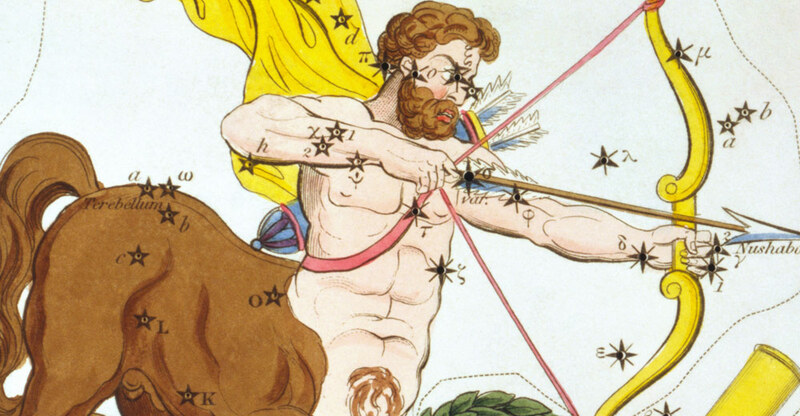 The horoscope encourages the Sagittarian´s confidence: Each day when you manage to swing through a little trouble, you'll feel like an ancient hunter who succeeded in lighting a fire with two bare stones. And if you solve a really big problem, your blood circulation will be flooded with endorphins and you will feel pleasure worthy of Edison the day he invented the light bulb. Don't forget: Good start is half the battle! During the year 2017 your senses will tune to a much finer awareness of your surroundings. Thus, as a very dense sieve captures very small particles, your sensitive attention will capture most subtle signals which come from the surroundings. Have you noticed someone who smells good passing by? Do you suddenly see in the mirror that the colors you are wearing today emphasize your style and personality? Do you see that the mood among friends in the room is very positive? Do you recognize new tones in your favorite track? According to the horoscope, these are exactly the feelings you will experience more throughout the whole year! Your senses will resemble a fine network of advanced screen-pixels that can credibly and accurately show all the information (so-called Full HD). Sagittarius, for all those with abusive intentions you will become the bright and hardly attainable prey. In addition, if you begin to scrutinize the river of events in your life, you will discover small particles of gold where you previously saw only common sand. The horoscope for 2017 advices Sagittarius: focus on the order of relationships and love. Friends, family members and love life – certainly not all your relations are chalky white. However, even minor problems or disagreements cannot be easily flushed down the sink like the crumbs off the dishes. But now you could hardly begin to chase everybody around, apologizing for injustices and showering people with gifts or flowers. You would look completely out of you mind. Instead, always choose a suitable time and place and try to offer your sincerity to your loved ones. Sagittarius, the 2017 horoscope predicts, this year you have the best conditions to have fulfilling job, which will move you forward. But it is not primarily about the career growth. You certainly know that you can do best only the things that you really enjoy. Those who love nature will probably suffer in a tyre factory. People who are passionate about mobile technologies would be desperate in a book archive (unless they are actually carrying out its digitalization), etc. If you are not satisfied with what you're doing at the moment, 2017 is a great challenge and opportunity to look for happiness elsewhere. More than ever, you can be attracted by dealing with people (counseling, health care, social service etc.) or by work in a larger team. Here you can chisel your talent to the perfect diamond shape.